← How to change PDF open action in batch? 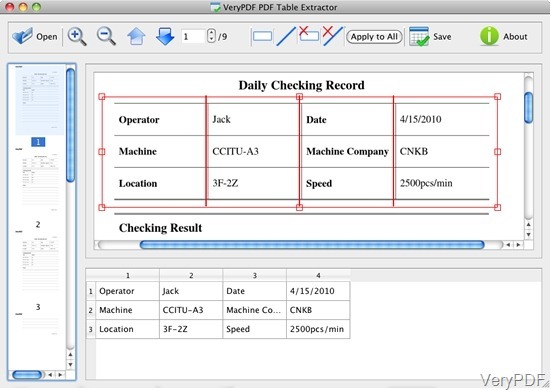 PDF Table Extractor for Mac is a very useful software which can help users extract PDF table data and save them to Excel sheet and CSV files. CSV files is compatible to almost all the emails and contact organizing applications, which is very useful to users. This software can help to save exported data to CSV files and maket it convinient for the users. Besides, this software can make users divide table columns based on their own needs and apply one table columns to all the PDF pages. First download the software to your PC and instal the application, then the interface will show on the desktop. Click the button”Open”and select the PDF file , put it to the interface, the PDF pages can be previewed on the left panel of the interface. The current pages will be displayed on the center of the interface. The button”Up”and”Down”help users to select the previous and the following pages of the PDF file. When you want to zoom in and out the curren page,click these two buttons. 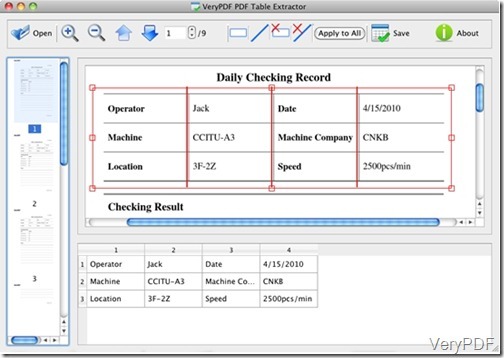 Specify the table area before exporting the content of PDF. With the button , users can draw a rectangle on the PDF pages and the convered part will be extracted and previewed in the centeral part of the interface. Click the button and move the mouse cursor to the top or bottom boder line of the rectangle, when the cursor become the cross”+”, draw a vertical line and the vertical line will divide the text into different columns which will be exported to different columns .The division effect will be previewed in the lower panel of the interface. In order to add a blank column, click the button and draw two vertical lines , making sure that there is no text between the two lines. User can delete the table columnswith the help of two buttons: . They are used to remove the table and remove the seleceted lines. If the table column is appliable to all the PDF pages, click the button “Apply to All ”and this column can be applied to all the PDF pages. Click the button”Save”and select CSV in the Save Files dialog, then the PDF tables are saved to CSV by PDF Table Extractor for Mac. Download the free trial version if you are in trouble with such problems , you will not disappointed! How to convert MS Office Excel to eps file using Document Converter? How to convert MS Visio documents of vsd to pcx? How to convert url to postscript?